As we approach a new millenium in this increasingly fast-paced and technology-driven world, many people are drowning in our culture of unremitting change. 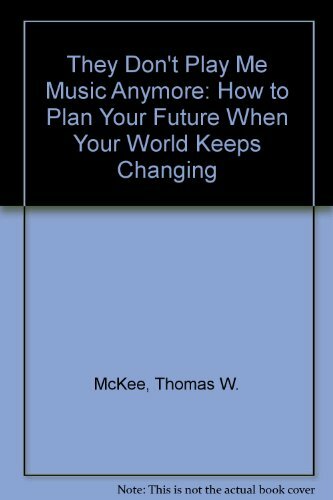 In the innovative book 'They Don't Play My Music Anymore', Thomas McKee presents a creative approach to facing personal and professional change. He offers eight essential principles that can help you gain the confidence to face an unknown future. Using these techniques, they will develop a new thinking frame by which to approach their future with hope and confidence as they learn to embrace change instead of merely reacting to it. Thomas W. McKee is a trainer, consultant, counselor and leader who has an extensive background in change management and conflict resolution. In the past 30 years he has consulted with many of America's top corporations and associations and has spoken to over one half million people in South Africa, Zimbabwe, Italy, France, England and the United States. 4. They Don't Play My Music Anymore McKee, Thomas W.